Twogether Studios has just launched the Kickstarter for our third game: ACTION CATS! 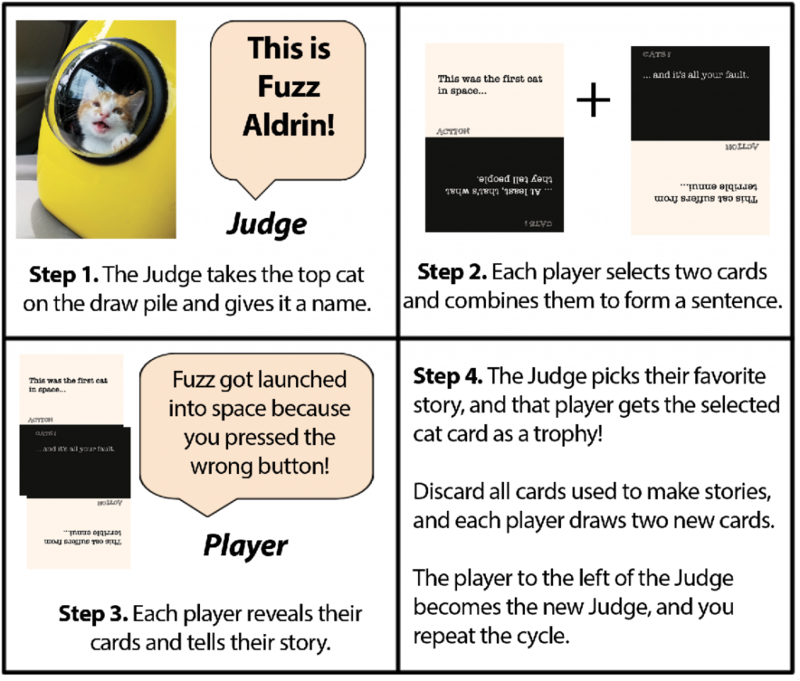 It’s a simple card game about revealing the secret lives of cats. 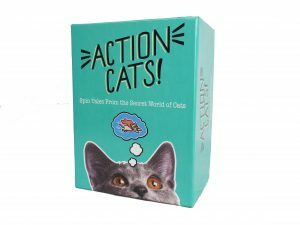 But what is Action Cats? Does the world really NEED another game about cats? Let me explain. Last fall, an online discussion left Jenn & I brainstorming ideas for games about the wild and unlikely adventures of cats. It should have ended there, but something about the idea stayed with me and I decided to make it as a thing to share with friends. 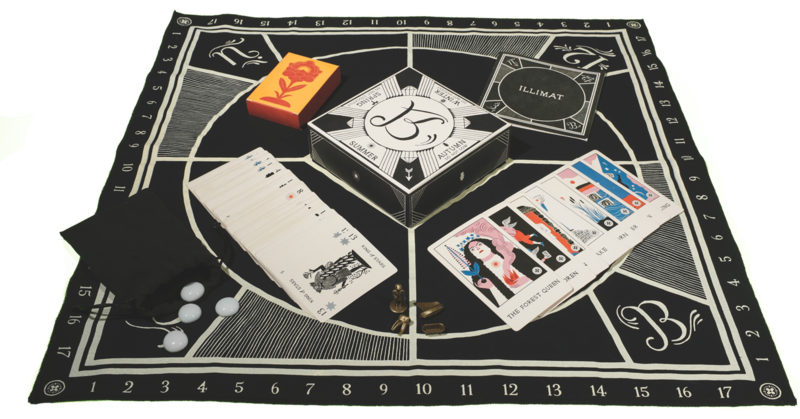 I love games that encourage storytelling; it’s my favorite aspect of Gloom. And when you look at a picture of a cat, it’s easy to imagine possibilities. Can they travel through time? Do they have a plan to take over the world? 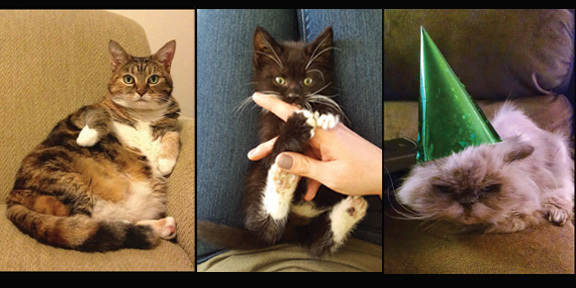 I asked friends to share pictures of their cats, and over the course of a few months I tinkered together a prototype. I didn’t expect it to go any further than that, but as we played it with friends, we just found that it was a lot of fun. Looking at an adorable picture of a cat makes bad times better, as does sharing stories and laughter with friends. So Jenn and I decided that we wanted to make this game… so here we are. 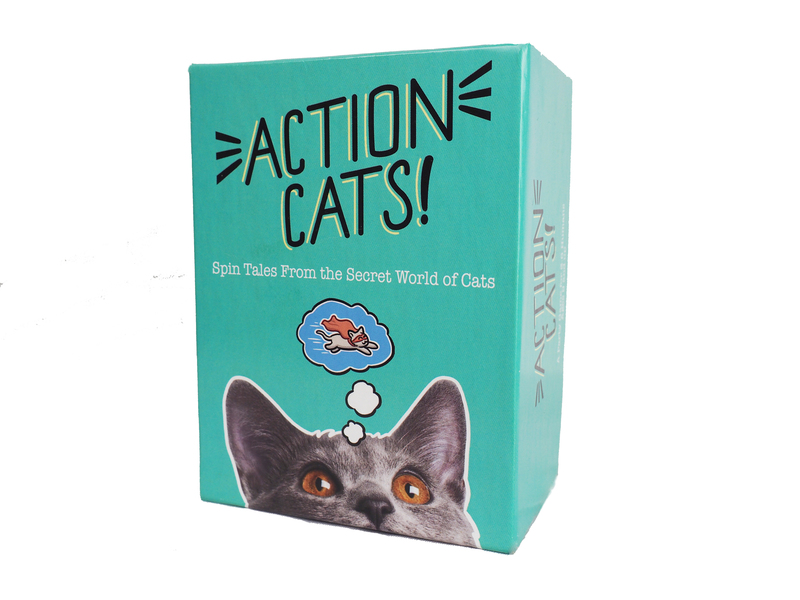 Action Cats is a simple design. You’ve played games like this before. But here are the things that drove me to make this one. It’s compact. Each card in the deck includes two separate prompts and a cat on the back. 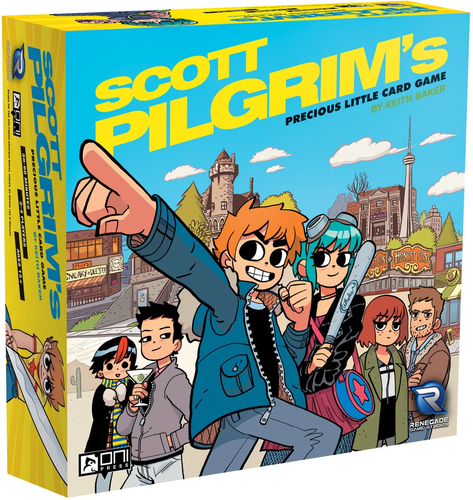 While it’s only 160 cards, there’s over twenty-five thousand possible story combinations. It encourages and assists storytelling. Like Gloom, you can choose to play Action Cats with no elaboration. If you’re not feeling creative, you can simply read the text as it’s written on the cards. 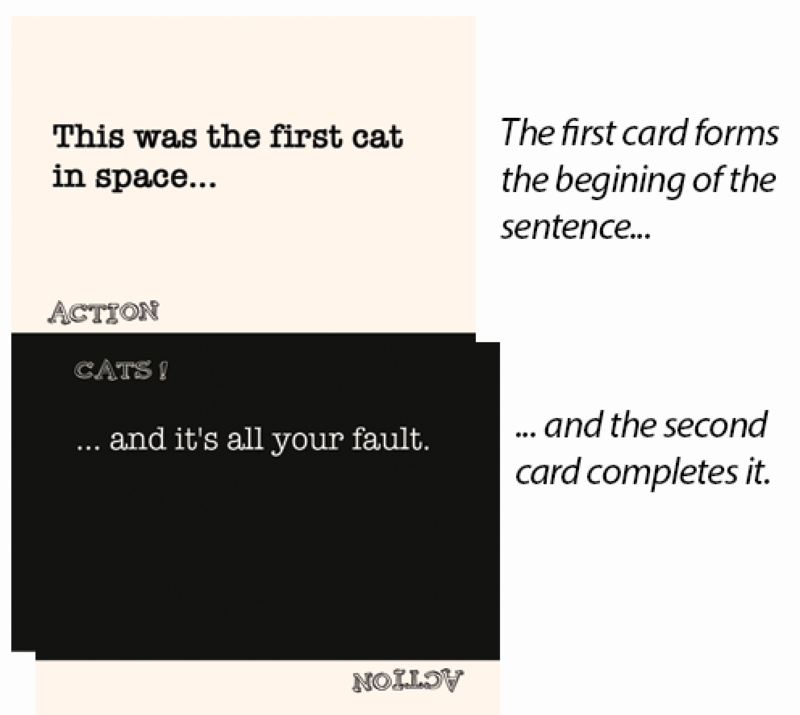 But Action Cats encourages you to use the prompts as a foundation and expand upon the story. The name of the cat may provide inspiration, and you can also build on the stories of the players who have gone before you. So even if you end up using the exact same combination of cards in two games, you may end up telling a different story with those cards. This cat was the first cat in space and it’s all your fault… but is that because you pushed the wrong button and launched the rocket while they were inside, or is it because you bought this cat their first telescope? It’s quick, easy and family friendly. It’s got cats. Our original round of donors provided an amazing selection of cats. Every time a new cat comes up, it brings a smile to my face and ideas for stories. For the final game we’re asking every backer to share pictures of their own cats, and I have no doubt that we’ll end up with an inspiring and adorable selection. If your cat has a story to tell, you can send us your pictures… and maybe they’ll be the next Action Cat! WHAT ABOUT YOUR OTHER KICKSTARTER? WHEN DO YOU EXPECT THIS TO BE RELEASED? We’re keeping it simple. No add-ons. 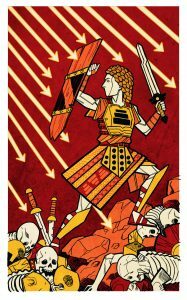 Stretch goals that enhance the game without adding entirely new things to be created. Nothing involved but a box and cards. We’re printing it domestically. We’ll be printing Action Cats in the US, which reduces risks and delivery time. We’re almost done with the game. We’ve been playing the game for months. We’re expanding the original game, adding many new cards and cats – but we expect to get the game to the printer within weeks of the end of the campaign. All we need to finish it are pictures of your cats. Get (your cat) in the game! 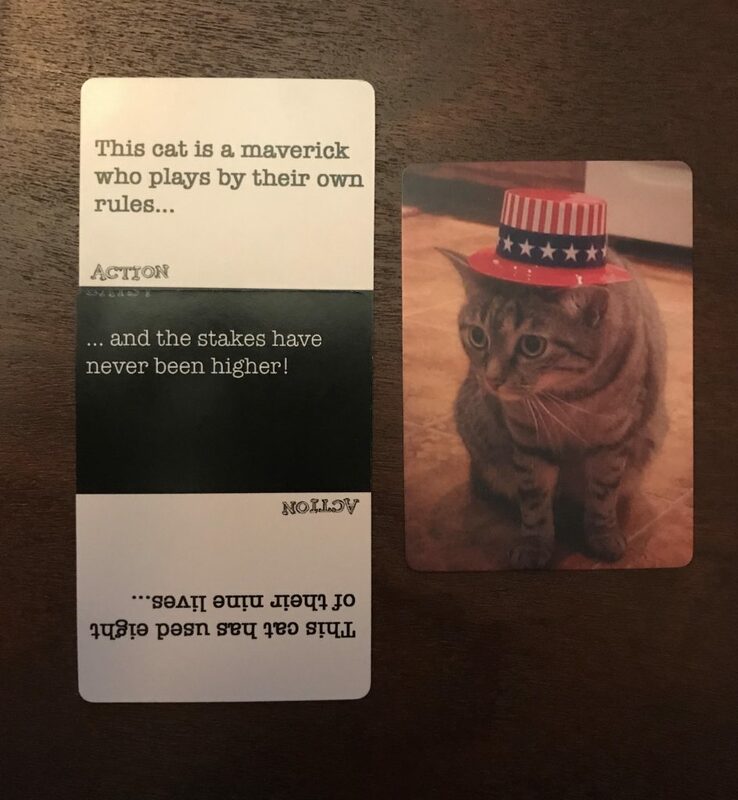 We’re building this game with 100% crowdsourced cats, and anyone who backs the game can submit pictures of their cats for consideration. As there’s only 160 cards in the game, not everyone’s cat will be included… but this is the chance to get your cat in the running. Help us expand the game. We don’t know what the demand will be for this game. We’re starting with 160 cards. 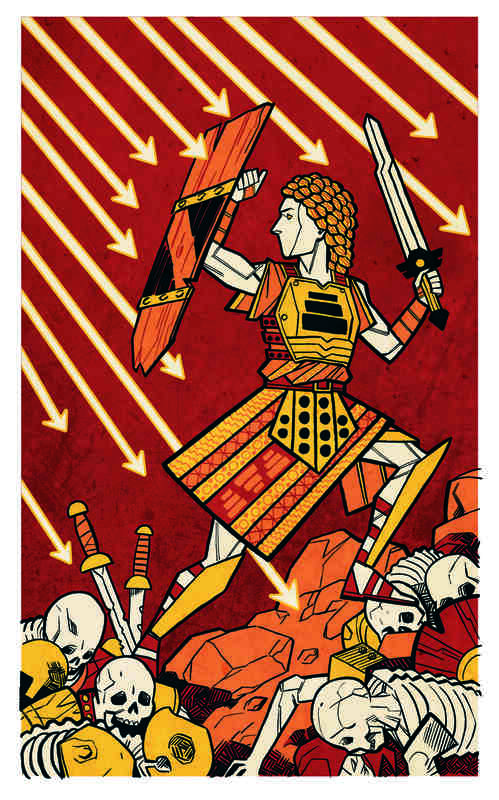 But if the campaign does well, we’ll add additional cards to the set. 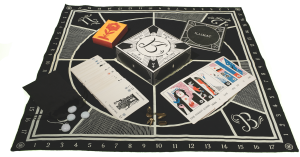 By backing now, you help us increase the size of the core set. Action Cats is a simple game, but it’s fun and I can’t wait to share it with all of you! If you have questions ask away – otherwise, go to the Kickstarter page and check it out for yourself!